The Indian hockey team’s build-up to the Athens Olympic Games received a shot in the arm today as it won a four-nation hockey tournament in Hamburg after beating Spain 4-2 in its last match. Ketan Bhobe won three gold medals in badminton and Aslam Pasha claimed two in athletics on a bumper day for India at the Special Olympics in Dublin, Ireland, which saw the country nearly double their medals tally overnight. Andre Agassi had to dig deep to reach the second week at Wimbledon yesterday as Russia’s new generation of women stars took the All-England Club by storm. 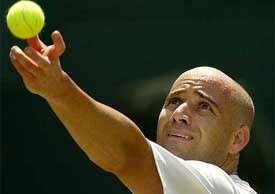 Agassi was given a severe centre court examination by Morocco’s Younes El Aynaoui, a fellow member of the small club of fathers on the men’s tour. Britain's Tim Henman celebrates his victory against Sweden's Robin Soderling in their third round match at the Wimbledon Tennis Championships in London on Saturday. 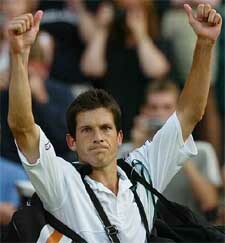 Henman won the match 6-3, 6-1, 6-4. South Africa all-rounder Jacques Kallis scored his second limited-overs century in two days to set up his side’s 46 run victory over Zimbabwe in the triangular series on Sunday. In the end, the English needed help from an Asian to turn things around on the cricket field. After the humbling loss at the hands of Heath Streak’s men in the opening one-day international, England staged a remarkable recovery to beat South Africa by six wickets in the second match of the Natwest triangular series, thanks to a stunning century by Vikram Solanki. Fast bowler Corey Collymore grabbed a career-best 7-57 to enhance the West Indies’ chances of winning the second and final cricket Test against Sri Lanka at Sabina Park here today. Spinners Murali Kartik and Amit Mishra shared seven wickets between them as India ‘A’ took a comfortable first innings lead despite a fine century by Gordon Muchall on the third day of the four-day cricket match against Durham county at the Riverside stadium in Chester-le-Street today. The working committee of the Board of Control for Cricket in India (BCCI), originally scheduled to be held in Delhi on June 30 and July 1, will now be held on July 2 and 3 to deliberate on some important matters, including India’s performance in the ICC World Cup 2003. Turkey did just enough to beat Colombia 2-1 yesterday and clinch third place in the Confederations Cup in a game played under the shadow of Cameroon player Marc-Vivien Foe’s death in the semifinals. The Turks, who also claimed third place at last year’s World Cup, picked a second-string team, fielding only three players who had appeared in its four previous encounters in the eight-nation tournament. Cameroon’s big central defender Lucien Mettomo was reduced to tears as he talked about the death of his former Manchester City team-mate and friend Marc-Vivien Foe. Still shocked after the death of Marc Vivien Foe at its Gerland stadium three days ago, the city of Lyon, where Foe’s family is living, was mourning the Cameroon midfielder today. Olympic chiefs have opened the door for Afghanistan to return to the Games next year, lifting the suspension imposed on the nation in 1999 when it was under Taliban rule. As many as 31 sports nurseries, under the Haryana Sports and Youth Welfare Department, would begin functioning from July 14 after the trials of aspiring children from July 1 to 4. India, who won two of their three matches while losing the other, finished the tournament on six points, one ahead of world champions Germany. Germany, whose only victory in the tournament came against India yesterday, played out their second draw of the tournament today, a 4-4 result against Argentina in the last match of the event, according to information received here. India’s triumph in the tournament comes on the back of a successful tour of Australia earlier this month for a two-leg event, of which India won one and finished runners-up in the other. An ecstatic coach Rajinder Singh said the victory in the tournament showed that the team was on the right path and hoped that the momentum would continue till the Athens Olympic Games next year. “It has really been a fabulous performance by our boys in this tournament. We played extremely well in all the three matches, even in the 3-2 loss against the world champions,” Rajinder Singh told PTI. “The performance in this tournament has shown that our boys are on the right track. We have been experimenting with our strategies and they have paid off. “The boys have been doing well consistently and I am sure they will carry on the good work not only in the Champions Trophy next month and but till the Athens Olympic Games next year,” he said. In today’s match against Spain, the Indians were in full control for most part of the proceedings and at point enjoyed a 3-0 advantage. Kanwalpreet Singh scored the first goal for India as early as early as the third minute. Goals by Gagan Ajit Singh through a penalty corner in 18th minute and Deepak Thakur in the 24th minute saw India surge ahead to a 3-0 lead before Spain could score their first goal just before half-time. Eduardo Aguilar scored a field goal to re-energise the Spanish team ahead of the breather. Spain narrowed the scoreline to 3-2 in the 56th minute when Juan Escarre scored through the team’s fifth penalty corner. But just three minutes later, Dilip Tirkey rounded off the tally through a field goal. Former captain Baljeet Singh Dhillon said the team was “moving forward” with every tournament. 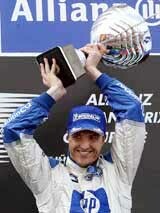 “We won in Australia and now we have won here. We are taking the right steps in the forward direction,” he told PTI. Dhillon was very pleased with the performance of the younger players, who constitute a majority in the team, and said this victory would be a big boost for them. India won as many as 45 medals yesterday, including 10 gold medals, to take their tally to 92 from 47. Ketan, a 17-year-old Goan who had won the gold in the badminton singles, took the top honours in the doubles and mixed doubles as well to return a cent per cent result. Karnataka’s Aslam Pasha, India’s only athlete on wheelchair, brought two gold medals for the country in shotput and 200m wheelchair race in which he clocked 3min 19.96sec, according to information received here. Runi Khatun (shot put), Mohd Salim Shaik (50m butterfly swimming), Hunny Saini, Prabhjot (2), Perpetua (all badminton) were the other gold medal winners for India. 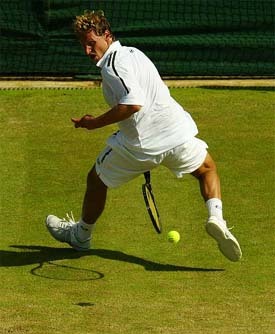 Number two seed Andre Agassi of the US serves to Younes El Aynaoui of Morocco during their third round match at the Wimbledon Tennis Championships in London on Saturday. 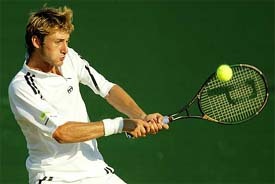 Argentina's David Nalbandian returns to Slovakia's Karol Kucera. 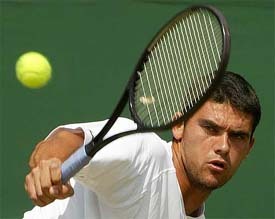 Australia's Mark Philippoussis plays a return to Radek Stepanek of the Czech Republic in their third round match. But after three and a half hours, the world number one finally prevailed 5-7 6-4 7-6 (7/4) 7-6 (7/4), surviving three set points in the 12th game of the fourth set which would have sent the match into a gruelling fifth set. Afterwards Agassi underlined that he had gone into the match with a crucial advantage over his opponent, the father of two young sons. “There are not too many guys I play who get less sleep than I do and Younes is one of those guys,” joked the American, who has a 20-month-old son of his own, Jaden Gil, with his wife Steffi Graf. Agassi now faces an intriguing fourth round clash with Australia’s Mark Philippoussis, who is enjoying a new lease of life after finally putting the knee injury problems which threatened to end his career behind him. Philippoussis, whose pounding serves earned him the nickname Scud, went through at the expense of the Czech Republic’s Radek Stepanek 4-6 7-6 (9/7) 6-4 7-6 (8/6). Tim Henman kept Britain’s hopes alive by reaching the second week for the eighth consecutive year with a straight sets win over Swedish qualifier Robin Soderling. To the delight of a packed centre-court crowd, the British number one, seeded 10, won 6-3 6-1 6-4 to set up a fourth round clash with last year’s finalist David Nalbandian of Argentina, who edged Slovakia’s Karol Kucera 6-4 5-7 6-7 (1/7) 6-4 6-2. Spanish third seed, and French Open champion, Juan Carlos Ferrero also reached the last 16 with a 6-4 6-4 2-6 6-4 victory over Sarg is Sargsian of Armenia. Five of the 16 players left in the women’s singles hail from Russia and there is no doubting which of them is generating the most excitement. Maria Sharapova, the darling of the Wimbledon photographers, displayed a ruthless streak to match her killer looks as she swept aside Jelena Dokic, the 11th seed, 6-4 6-4. After setting up a fourth round clash against fellow Russian Svetlana Kuznetsova, Sharapova gave the world’s media a glimpse of the competitive drive that has carried her so far, so young. “When I come into a tournament I am expecting to win, that is my philosophy,” said the 16-year-old who was joined in the fourth round by top seed and defending champion Serena Williams, who eased past compatriot and 28th seed Laura Granville 6-3 6-1. Williams will now face Russian number one Elena Dementieva, who ended the challenge of Hungarian qualifier Aniko Kapros. The surviving Russian contingent is made up of Kuznetsova and Anastasia Myskina, both of whom went through yesterday, and Vera Zvonareva, who will face Venus Villiams. Jennifer Capriati, the eighth seed, disposed of Japan’s Akiko Morigami 6-4 6-4 while third seed Justine Henin-Hardenne came through at the expense of Australia’s last woman standing, Alicia Molik, by the same scoreline. Germany’s Alexander Popp gave British fans a glimmer of consolation for their players’ dismal Wimbledon showing when he eliminated 11th seed Jiri Novak. Henman may be the only true Brit left in either the men’s or women’s singles but Popp at least has a British mother and admits his affinity with the country may have contributed to his success here. “I feel English a little because my mum is English and we speak English a little at home,” Popp, a quarter-finalist here in 2000, said after his 6-3 6-4 7-6 (7/3) win over the experienced Czech. “I feel at home when I’m here and I’ve always played we all even in the smaller tournaments so there must be something in it.” Off court, security was again under the spotlight after a tabloid newspaper reporter bluffed his way into a job guarding top players including Serena Williams and her sister Venus, both of whom have attracted the attention of stalkers. After a late run charge engineered by Kallis, who struck his highest one-day score, South Africa reached a competitive total of 272 for five from their 50 overs. Kallis, who stroked 107 in a losing cause against England at The Oval yesterday, took 89 balls for his first 50 against accurate bowling but needed only 48 more deliveries to reach his 10th one-day century with his 10th boundary. Coming to the crease with his team on seven for one after being asked to bat on a hot, sunny day, Kallis found an able assistant in Andrew Hall, promoted to number five, who scored 56 and helped add 91 for the fourth wicket. 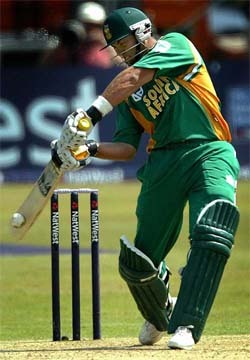 Andy Blignaut made the initial breakthrough, bowling Herschelle Gibbs for five playing over a leg-stump yorker. Captain Graeme Smith took 21 balls to reach seven before he was palpably lbw to Douglas Hondo shuffling in front to an inswinger. Kallis made a fluent start with boundaries through extra cover and square leg but was then restricted by some accurate Zimbabwe bowling. Jacques Rudolph struck three fours in his 32 before he was frustrated by left-arm spinner Ray Price and slashed a catch to Grant Flower at backward point. Hall brought some much-needed momentum to the South Africa innings, scurrying some quick singles and lofting Price for two sixes over long on. He brought up his second one-day half-century with another six, reaching his 50 from 42 balls with three fours and three sixes. Hall finally perished trying for another six over mid-wicket off Sean Ervine and was held by a diving Flower running in from the fence. Wicketkeeper Mark Boucher hit a quick 17 before he was bowled by Hondo from the last ball on an over costing 13 runs as South Africa accelerated their run rate. FoW: 1-7, 2-29, 3-84, 4-175, 5-220. Bowling: Streak 10-1-50-0, Blignaut 8.5-1-66-1, Hondo 9.1-3-29-2, Price 8-1-37-1, Ervine 5-0-39-1, Marillier 4-0-19-0, Flower 5-0-28-0. FoW: 1-3, 2-112, 3-146, 4-158, 5-170, 6-176, 7-178, 8-200, 9-212. Solanki’s success is yet another indication that the most British of sports is increasingly looking to players with roots in the subcontinent to woo new and young audience even as it tries to compete with football. Solanki, for his part, is proud of his Indian roots. He migrated at the tender age of eight years after his parents decided to move out of Udaipur in the 1980s but keeps visiting his vast network of relatives and family friends in his native town. “I know my roots and I visit my family and friends regularly. We’ve tried to remain in touch with our roots in India,” the Worcestershire batsman, who flayed the South African attack for an attractive 106 at the Oval yesterday, said earlier. This is the second coming of Solanki who made his debut for England three seasons ago but after eight indifferent one-dayers was sidelined. He staged a comeback last season with 900 county runs and afforded another chance, has grabbed it with both hands. And, embarrassingly enough, Solanki has already been compared to Virender Sehwag by none other than his captain Michael Vaughan himself. “If you want to call him a Sehwag, you can,” Vaughan was quoted as saying by the Associated Press. “Vikram is that kind of player. One day he will get a low score and like here he came out and played exceptionally well. We accept that. “He is just a natural stroke player. He is a natural player all around the wicket, and very talented player,” Vaughan added. Solanki himself has made it known earlier that he was a big admirer of the original master blaster, Sachin Tendulkar. “It’s a treat to watch him and you could learn so much from him. He is obviously the best batsman in the world,” he had said. He had lot of time to watch Tendulkar from close when the Indian star struck a majestic 169 against Worcestershire in a tour game during India’s tour of England last summer. He himself could manage only five runs from eight balls before being caught by Rahul Dravid off Ajit Agarkar. At the Oval yesterday, Solanki looked skywards when he reached his fifty and hundred, gesture of a typical Indian cricketer. The West Indies were 20-1 at lunch on the third day chasing a 212-run target to win the match and series after Collymore’s second successive haul of five or more wickets in a Test innings. The opening Test had ended in a draw. Wavell Hinds was batting on 10 with Ramnaresh Sarwan (6). Sri Lanka were shot out for 194 after resuming their second innings at 129-5, with Collymore capturing all the five wickets for just 31 runs in his eight incisive overs to return the best figures by a West Indian at this venue. Durham declared their first innings at 333 for nine, 149 runs behind India ‘A’ score of 482-9 declared. By the end of the day, India ‘A’ had scored three runs without loss in their second essay to extend their lead to 152. The star of the day for the hosts was the 21-year-old all-rounder Muchall who batted for close to five hours to compile a 121-run knock that included 12 boundaries. Muchall put on 139 runs for the second wicket with Michael Gough who scored a gutsy 56 from more than four hours of batting. However, once leg-spinner Amit Mishra got rid of Gough, stumped by wicketkeeper Parthiv Patel, the Indians were able to claim wickets at regular intervals. Gary Pratt (10) and Nicky Peng (5) were dismissed cheaply by Kartik, who finished with four wickets for 112 runs, before Mishra produced the big wicket of Muchall at the score of 240. A defiant eighth wicket stand of 66 between Ian Hunter and Nick Phillips saw Durham crossing the 300-run mark. Hunter made a quickfire 44 from 54 balls with five fours and a six, while Phillips contributed 19, before Kartik broke the partnership. Durham declared their innings shortly before close. Just three overs were possible in India ‘A’ second innings and all the three runs were scored by first innings centurion, captain Shiv Sunder Das. Lewis b Bhandari 20, Gough st Patel b Mishra 56, Muchall c Patel b Mishra 121, Pratt c sub b Kartik 10, Peng c Patel b Kartik 5, Wells c Pathan b Mishra 1, Mustard c Rayudu b Kartik 2, Hunter c Gambhir b Kartik 44, Phillips b Balaji 19, Davies not out 9, Hatch not out 3. Extras (b-4, lb-10, w-2, nb-27) 43. Total (for 9 wkts decl, 123 overs) 333. Fall of wickets: 1-36, 2-175, 3-204, 4-232, 5-240, 6-241, 7-244, 8-310, 9-327. Bowling: Balaji 18-3-45-1, Pathan 19-6-37-0, Bhandari 8-0-37-1, Kartik 45-10-112-4, Mishra 32-7-85-3, Gambhir 1-0-3-0. India ‘A’ (2nd innings): Das batting 3, Gambhir batting 0. Extras 0, Total (for no loss, 3 overs) 3. The working committee will also consider the extension of the contract of coach John Wright, physiotherapist Andrew Leipus and the fitness trainer of the Indian cricket team. New physical trainer Gregory Allen King of South Africa took charge two days back, but his contract will be endorsed only after deliberating in the Working Committee meeting. Allen King has replaced fellow-South African Adrian Le Roux, who quit his assignment in India to take up a lucrative assignment in his own country. Thirtytwo items have been put on the agenda, which has been circulated to the affiliated units by BCCI secretary S.K. Nair. The important items in the agenda include finalisation of the scheme to distribute funds to all first class and junior cricketers as well as formulating insurance and annuity schemes for them. The other items up for discussion include updating on the matter pertaining to contract system and graded payments for players, and to discuss and approve the itinerary of the New Zealand team’s tour of India and the triangular series featuring India, Australia and New Zealand from September to November 2003. The agenda has also listed the letter of the Punjab Cricket Association (PCA) regarding payment of prize money for the Under-15 Polly Umrigar Trophy Tournament. The working committee meeting will also finalise the venue for the Challenger Series for the NKP Salve Trophy, scheduled to be held from September 11 to 14, which will herald the domestic cricket season. The Challenger Series will feature India Seniors, India A and India B teams. Other important matters to be discussed in the working committee meeting are: players’ endorements and IDI sponsors in the ICC World Cricket World Cup 2003; to approve the itinerary of the Indian cricket team’s tour of Australia from November 2003 to February 2004; to deliberate on the outcome of the captains’ and coaches’ meet held in Mumbai on June 6; to consider the proposal of the Board of Control for Cricket in Sri Lanka for the visit of the Sri Lanka A team to India in November-December 2003; India’s hosting of the under-17 Asia Cup; Afghanistan Cricket Association’s proposal to send their national team to India to play a few matches; to discuss the report on the activities of the National Cricket Academy and the zonal cricket academies, and the restructuring of the National Cricket Academy; to discuss the matters arising out of the BCCI’s spinners’ panel meet held in Kolkata on May 30; to review the benefit match rules; to discuss a letter from former Indian captain Ajit Wadekar with regard to a scheme of former cricketers who have not been beneficiaries of the Sharjah tournaments and to discuss the recommendations of the Tour, programme and fixtures committee with regard to the domest cricket calendar 2003-2004. Virender Sehwag cracked an unbeaten century to help Leicestershire consolidate their position in a four-day county match against Nottinghamshire at Grace Road yesterday. Sehwag, who opened the innings, was unbeaten on 121 off 122 balls at close of play. It was a characteristically aggressive knock by the India opener, studded as it was with 23 fours. Turkey did just enough to beat Colombia 2-1 yesterday and clinch third place in the Confederations Cup in a game played under the shadow of Cameroon player Marc-Vivien Foe’s death in the semifinals. The Turks, who also claimed third place at last year’s World Cup, picked a second-string team, fielding only three players who had appeared in its four previous encounters in the eight-nation tournament. 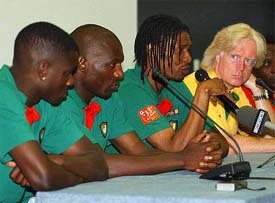 But the celebrations were dampened by the death of Foe, a celebrated player and personality in Africa and Europe. The 28-year-old midfielder collapsed and later died at Cameroon’s semifinal game against Colombia on Thursday. The cause of death was being investigated. The players of both sides wore black armbands, and the 18,237 fans at the Stadium Geoffroy-Guichard hushed for a minute’s poignant silence before the game as a mark of respect to Foe. Colombia’s players said before the game they were still coming to terms with Foe’s sudden death, but coach Francisco Maturana said they were composed on the pitch. “We felt his death in our hearts but once we started playing our minds were totally focused on the game,” he said. Tuncay Sanli got his third tournament goal after just two minutes when he exploited a defensive blunder to hit a thundering shot from just inside the Colombian area. Giovanni Hernandez levelled the score after 62 minutes and also clinched a triple of Confederations Cup goals, linking up with Victor Aristizabal to burst into the Turkish area and tap the ball past Omer Catkic. The two joined Frenchmen Thierry Henry and Robert Pires and Japan’s Shunsuke Nakamura atop the scoring standings. With four minutes left on the clock, Turkey broke quickly down the left and had four men against three as Tuncay passed inside for substitute Okan Yilmaz to fire a shot into the corner. The game, though, was mostly a display of poor ball control, mishit passes and weak finishing. Turkey had just three shots on goal in the entire game, while Colombia managed its first shot on goal in only the 35th minute. 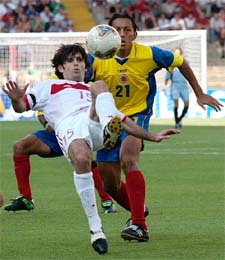 Colombia fielded its strongest team, including pacey winger Elson Becerra. “I try to be strong, It’s terrible. Thursday’s events pass again and again through my head,’’ Mettomo told reporters as Cameroon prepared for the Confederations Cup final against hosts France in Paris. Foe collapsed during Cameroon’s 1-0 semifinal victory over Colombia in Lyon and died shortly afterwards. “The only way to comfort her (Foe’s wife) is to bring him back,’’ Mettomo, Foe’s room mate, said on Saturday as he tried to hold back the tears. Mettomo, who said he regarded Foe as “a big brother who was an integral part of my life’’ went through the routine that he and Foe followed on Thursday before the semifinal. The routine included Foe’s suggestion that they share one bag because that would bring them luck after having done the same before their 1-0 upset win over world champions Brazil. “Now that he’s not there any more, I don’t know I’m going to make it,’’ Mettomo, at 26 two years younger than Foe, said. Mettomo said Foe was still breathing when he lay flat out on the pitch after collapsing and that, having been carried off, the team expected to find him in the changing room or hotel after the match and tell them how it had gone. “I’m still trying to understand how all that could have happened,’’ Mettomo said of the outcome. Foe stopped breathing, doctors said, after being carried off and more than 45 minutes of efforts to restart his heart failed. Mettomo said that in the heat of the moment he questioned the doctors’ efforts when they said they had done everything they could to revive Foe. The player’s wife, Marie-Louise, was to be flown to Paris by a private flight chartered by French champions Olympique Lyon to attend the Confederations Cup final between Cameroon and France. Foe died after collapsing during the competition’s semifinals against Colombia. Lyon’s prosecutor office said they had not yet authorised the body to be handed back to Foe’s family while further tests were underway. Foe’s funeral should take place in midweek at Lyon’s St Jean church and Lyon players, now in pre-season training in the ski resort of Tignes, will drive down to attend the ceremony. Foe played for Manchester City on loan but still belonged to Olympique Lyon and the French champions were all shell-shocked by the news of his death. Club president Jean-Michel Aulas cancelled a trip to Spain to discuss transfers and decided that Foe’s shirt number of 17 will from now on be removed from the team’s line-up. The same will apply at RC Lens, the French club at which Foe made his European debut. The International Olympic Committee (IOC) did not accept the sports policy of Afghanistan’s former Taliban rulers, who rejected a request to permit women’s sports. But the nation could now return to competition in time for the 2004 Athens Olympics, Executive Director for the Olympic Games Gilbert Felli said today. Out of these, 18 would be adopted by the sports department and 13 by boards and corporation of Haryana for the promotion of different sports events. The players selected in the nurseries would be provided free lodging, boarding, education, sports kit, coaching and pocket money as per norms, according to Mr M.S. Mann, Director, Sports and Youth Welfare, Haryana. The players eligible for these nurseries should be in the 8-10 age group for gymnastics and 10-14 age group for other games and sports for new entrants. Progress of the players in the nurseries would be reviewed during the selection trials by the selection committee set up by the department. The selection trials for these nurseries would be held from July 1 to 4 at the venue of the sports nurseries in different districts of the state. Those interested should contact their respective district Sports and Youth Welfare Officers for detail information. Nurseries to be set up by the Sports department would be at Ambala (gymnastics-girls), Bhiwani (athletics-boys), gymnastics -Boys/Girls, bolleyball-boys), Faridabad (cricket-boys), Hisar (judo-boys), Jhajjar (wrestling-boys), Narwana-Jind (athletics-boys), Nidani-Jind (wrestling-boys), Madhuban-Karnal (judo-boys), Rewari (boxing-girls), Rohtak (wrestling-boys), Sirsa (badminton-girls, table tennis-boys), Chautala-Sirsa (volleyball-girls), Sonepat (wrestling-boys), Khanpur Kalan-Sonepat (volleyball-girls, judo-girls). Nurseries to be set up by boards and corporations: Shahbad-Kurukshetra (Harco Bank) hockey-girls, Gurgaon (Harco Bank) hockey girls, Sirsa (Harco Bank) hockey-girls, Sirsa (HWC) table tennis-girls, Nidani-Jind (HWC) wrestling-boys/girls, Kurukshetra (HSIDC) volleyball girls, Chautala-Sirsa (HSIDC) boxing-boys, Sirsa (HFC) judo-girls, Kaithal (HUDA) kabaddi-boys, Panipat (HUDA) kabaddi-girls, Jhajjar (HAFED) wrestling-boys.